Over the years, many items of precious, historical interest have been lost in London- fire, bomb-damage and the general passage of time being the main culprits. A much rarer cause is theft. I was conducting a tour earlier today, and decided to introduce my guest to my favourite London sculpture. I first came across the statue in question whilst studying ‘The Knowledge; it was a public artwork which I hunted down mainly due to one particular examiner’s regularity in asking candidates the point of interest. The statue was known as Doctor Salter’s Daydream. 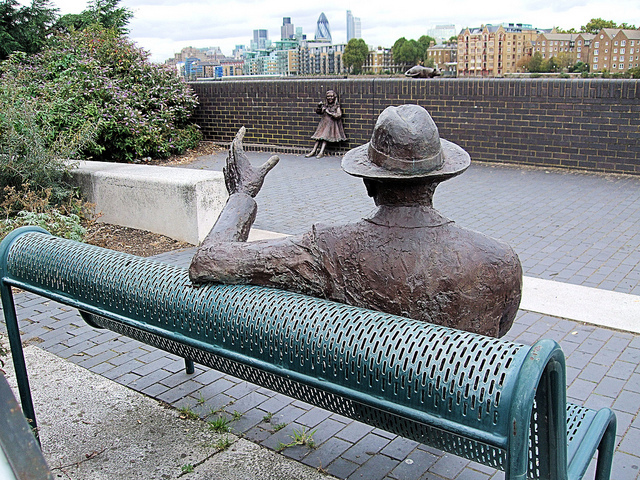 Located on Bermondsey Wall East; an isolated spot by the Thames, the statue was a fairly recent creation in London terms, having been crafted in 1991. On a cold, grey winter afternoon; Tower Bridge and the Gherkin in the near distance, shrouded in a damp mist, we pulled up on Cathay Street; a quiet road opposite The Angel (a wonderful pub which is well worth the visit). Leading my guest towards the area where the statue was based, I was dismayed to see… absolutely nothing. A sign fastened to the bench (upon which part of the sculpture once sat) explained the situation: the piece was stolen in November 2011, and a £2,000 bounty was on offer for its safe return. A set of empty, rusty holes; once home to a pair of fastening bolts, confirmed the awful crime. The notice also informed us that the second half of the statue; which stood by the Thames wall, had been removed and placed in storage by the local council for its own safety. My heart sunk immediately, for I could only assume that the violation had been committed due to the current trend for pinching valuable metal and selling it for scrap. A similar event took place in December 2011, in which an abstract Barbara Hepworth sculpture was taken from Dulwich Park having stood there since 1969. When metal is swiped for scrap, it generally has one fate- to be melted down and re-cast. In order to understand my upset at the disappearance of Dr Salter’s statue, I should explain who he was, and the great poignancy which lay behind his sculpture…. Doctor Alfred Salter was a Londoner; born in Greenwich in June 1873. He came from a humble background; his parents were both deeply religious and his father worked for the Metropolitan Gas Board. At the age of 16, the young Alfred won a scholarship to study medicine at Guy’s Hospital. He excelled in his chosen field, winning various awards and qualifying as a doctor in 1896. As a student, Dr Salter had visited many working-class homes in the south London district of Bermondsey, and the shocking poverty he encountered encouraged him to develop a committed social conscience. Shortly after becoming a doctor, Alfred met and fell in love with Ada Brown; a young woman who shared his compassionate attitude towards the poor. “I have been paying numerous visits to derelict families… several of the homes I have just been into made me feel aghast at my helplessness and powerlessness to lift their occupants out of their existing poverty and squalor. And so it was done; Alfred and Ada decided to devote their lives to the poverty-stricken residents of Bermondsey. Whilst others with education and the means to afford decent homes in the comfortable suburbs steered well clear of such districts, Alfred and Ada moved into Bermondsey, and the kindly couple set up a practice on Jamaica Road (still a major thoroughfare today, which takes traffic towards the Rotherhithe Tunnel). At the new practice, medicinal expertise was open to all; Dr Salter charging rock-bottom prices for his services. It has to be remembered that this was many years before the National Health Service was established, and such a surgery was a godsend to those crippled by poverty and illness. So successful was the enterprise that Alfred and Ada soon had to recruit more doctors in order to cope with the demand. In 1902, Ada gave birth to a daughter, whom she and Alfred named Joyce, and the burgeoning family soon moved to Storks Road, Bermondsey. In 1910, aged 8, Joyce Salter contracted scarlet fever and became seriously ill.
She was taken to the South Western Hospital, which stood on Landor Road in Stockwell. So acute was the local concern for Joyce Salter, that Alfred and Ada placed a regular bulletin on their front door, informing the distressed public of their daughter’s progress. Tragically though, Joyce soon died. During their lives, the commitment of Doctor Salter and his gentle wife, Ada saved many lives but the couple were sadly unable to save their own daughter. The pair never truly overcame their grief. Dr Salter kept a picture of his young daughter on the mantelpiece of his study for the remainder of his working life; a portrait which was routinely adorned with fresh flowers every single day. Dr Salter himself died a few years later in 1945- at Guy’s Hospital; the very same institution in which he had trained and gained the knowledge to help those whom he had devoted his life towards. Dr Salter was buried in Peckham; at the local Friends Meeting House. And so back to the statue of Dr Salter which was so cruelly stolen. The statue, created by artist Diane Gorvin, was made in three parts. The first- the piece which was looted- was of Dr Alfred Salter himself, and was placed upon a bench, thus allowing the public to share a seat with the great physician. 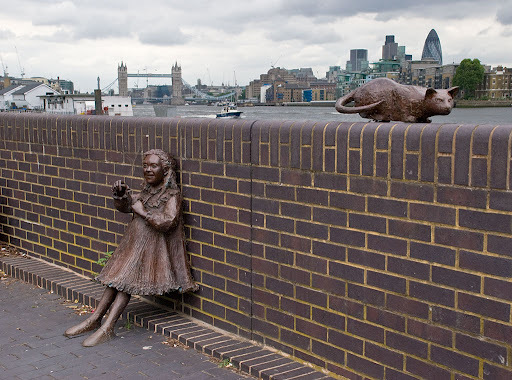 Several feet away, situated by the Thames wall, were two smaller statues representing Alfred’s daughter, Joyce and her little, pet cat. In the installation, Dr Salter was shown waving at the pair. However, the doctor was also portrayed as an old man, and the images which he- and we, the public- gazed upon were effectively ghosts; “shadows of the things that have been” (to quote the ‘Ghost of Christmas Past’ from Charles Dickens’ A Christmas Carol). How I wish that those who stole Dr Salter’s metal representation knew what life and tragedy this beautiful sculpture represented. What a wonderful man and family. Please do let us know if the statue is ever recovered. If you look at the Wikipedia entry on Dr. Salter, there is a picture of the familiar sculpture situated somewhere in Bermondsey, by a main road. Don’t know if Joyce and the cat are there too. I used to love to cycle along the thames when lived in London, and I feared once before that he had been pinched, but he had been taken away for cleaning. Hi Rob, thanks for the comment. Sadly, the statue had definitely been stolen this time around; was pinched late last year; most likely a victim of the current craze for nicking precious metal in order to sell it on and have it melted down. Joyce and the Cat are ok, but have been removed by the council and put into storage for their own safety. All very upsetting. How sad. The world is a richer place thanks to the likes of Dr Salter but a poorer one thanks to the likes of the thieves. Not wanting to get too political however it can’t fail to be noted. Dr Salters life work was socialism at it’s best and the recent spate of metal thefts is fuelled by increased prices driven by rampant unchecked capitalism (and mainly via Communist China!!). Funny old world! Many thanks for the kind words, Kinna 🙂 Hope you enjoy your trip.